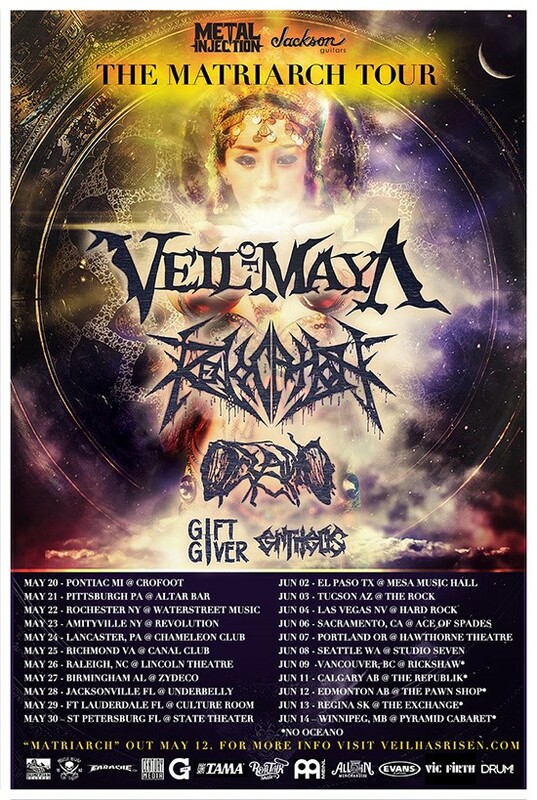 Revocation are back on the road this month supporting Veil of Maya! “The Matriarch Tour” begins on May 20th in Detroit, MI, and winds its way through the east coast, the south, and up into western Canada for a final show on June 14th in Winnipeg. A trailer for the tour can be seen now HERE. Tickets are on sale now through your local ticket outlet. In celebration of the tour dates, Revocation have prepared a series of lyric videos with fellow guitarist and director/animator Nick Hipa. The first, “Labyrinth of Eyes“, is streaming now on youtube HERE. “Album Review: Revocation – Deathless” debuted on the Billboard charts last month, beating their previous album by more than 30 spots to land at #124 on the Billboard Top 200 Chart. “Deathless” also debuted at #10 on the Billboard Hard Music Albums Chart (Current), #114 on the Billboard Top Current Albums Chart and #1 on the Billboard New Artist Chart. This is Revocation‘s second straight debut on the top 200 chart.